Google is way ahead of the pack when it comes to free analytics solutions in the market, despite the fact that it has some trivial limitations. A number of webmasters focuses their attention on the basic graphs and stats yielded by Google Analytics (GA) and can easily turn blind to other advanced features of this amazing analytics solution. Additionally, although it is equipped with capabilities abound, all the features are easily implemented. Traffic is a matter of primary concern for a good number of webmasters. However, it is worth noting that conversions take the precedence over traffic if you seek to establish a strong web presence. Regardless of the number of visitors on your website, it will render your purpose futile if they opt not to subscribe or buy from you. As an aspiring marketer, you work relentlessly towards the improvement in your conversion rates. However, it is imperative to keep a close watch on conversions in order to gauge statistically significant improvements over a course of time. 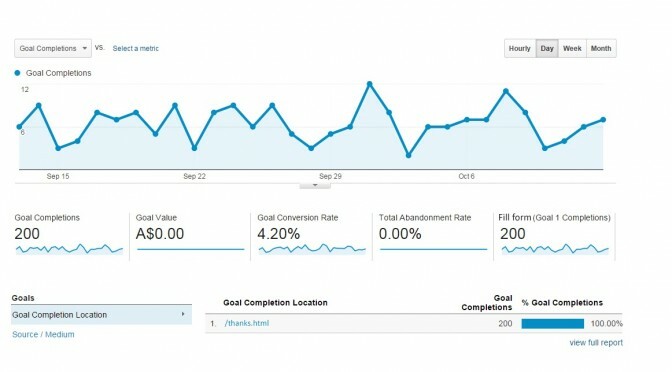 In Google Analytics, conversions are called “goals”. These are specific actions by visitors on your website, which are worth tracking. There exist only a few options as far as goals are concerned. However, it comes with a facility for customized features. Activities or actions prompted by a visitor, including loading an exclusive page, rendered following a sign-up for an email newsletter, are deemed as the best for a webmaster to keep a tab on. In 2013, content marketing has become a very important marketing tool. By now you must have realized how landing pages affect your as well as your clients’ SEO. Landing pages play major part in attracting traffic to your site. Building strong and competitive landing pages which are solely going to represent your brand image and able to drive more and more traffic to your web is extremely important. Content on landing pages should be attractive, interesting, concise and informative. Content should be up-to-date; as the visitor would like to get the latest information. Reduce ads on landing pages if they are distracting or lacking the essence of content. Keep a close eye on the metrics of your webpage and comments, feedback of your visitors, they will determine the engagement capacity of content. Make user friendly architecture of landing pages. Make effective use of diagrams, charts, screenshots, pictograms and videos in the content. Basic structural changes of landing pages should match the content and content layout. Arrange the landing pages corresponding to keywords. For main keyword, landing page should be the home page; but for other keywords position other concerned pages of your website accordingly. Identical arrangement of landing pages to keywords will help to rank better in search results. Use Google analytics to track ranking of your landing pages. You might lose the visitor/s of your site because of inappropriate keywords; so be alert. At given point of time you won’t know the knowledge level of your visitor regarding your product and business. Therefore build landing pages keeping in mind the view point of all visitors. Content should be able to answer almost all the questions of your visitor. Now after taking all necessary steps analyze the metrics of your landing pages in the form of bounce rate, average time per page, % exit etc. After analyzing find out if still there are any irrelevant landing pages coming in search results and fix them. Since its inception, Google Analytics has remained the impregnable tool in the screen of website analytics. The top 10,000 sites on the planet and 57% of the world are using this tool. Prior to its launch, people did not have access to a tool, but what this brought with it is a powerful, accurate analytics that helped masses and particularly site owners a lot. People now have freedom to make smarter decisions for their website and their business. Analytics seem to be the starting point for a myriad of tasks that encompass everything from increasing traffic to improving conversions or conceiving great new content ideas. However, as everything comes with a time limit, even the Google Analytics tool now seems to getting shorter on time. The many new tools that have now emerged, some of which are pretty good, has made it possible. Why get over Google Analytics now? The ubiquitous nature of Google sometimes causes a hindrance in its path, where people believe that controlling multiple parts can often seem uncomfortable. The complexity of the tool seems off-putting, and with the fifth version being released, this is bound to get intensified. Clicky seems to have a long list of pros that cannot be just overlooked. Live web analytics, helps you know how many people are visiting the page you are on now. This is free to use for 3,000 page views daily. Amazing as a free product, but the bounce rate and time on site weakness is same as Google Analytics, not perfect, but somehow the best free version out there. Although free, but this lacks few bells and whistles that are really important for any tool to be judged as a good analytics tool. For any person in search of staying away from the googly-eyes of Google, today there is no shortage of excellent alternatives to Google Analytics. From free tools to paid alternatives, the choices are many, what is needed is creating your own personal list. So, give these a try and get over the Google craze! Analysing how promotional activities and marketing endeavours encourage conversion is a complex matter. It is complicated due to the availability of multiple marketing channels for interaction, which customers use before conversion or purchase. Recently launched Multiple Channel Funnels in Google Analytics helps in drawing the attention towards the full path users follow to conversion, rather than depending on the last click, which gives blurred picture about what moves customers in the real market. Now, the data is available through an API, which facilitates developers to widen and automate the use of conversion cases with the data. The API (Application Programming Interface) allows the developers to make query for metrics like first interactions conversions and last interaction conversions along with assisted conversions. It also supports the top paths, path length, and time lag to integrate conversion path data into the application. Important use cases involve combining the conversions paths data with other sources such as cost data and creation of new visualisations along with use of data for initiating automate processes. The multiple channels help analyse the interactions that takes place across the internet through different digital media. The multi-channel funnels show how different channels work together and convert a purchase decision into sale. This tool is mainly built to help people make important marketing decisions regarding advertising and promotion at macro and micro levels. The five multi-channel funnels tool is capable of showing how customers interacted during 30 days before making purchase decision. The metrics drawn from the reports have shown the impact of different channels through conversion, time lag that helps understand the time period taken in conversion, path length that shows the number of conversations that took place prior to purchase, and top conversion paths customers take.